I plan to add more to this page including how to make your own QSL cards. You can buy 60 pound stock paper at Office Depot and FedEx and use it to make color cards with black overlays. Make a template of four cards and they can print some out. Use a paper cutter to cut the cards. I will upload a copy of my card soon so you can see a very simple card. Although my given name is Martin, I have gone by Marty most of my life. I am a native Houstonian, born 1959, member of Beautiful Savior Lutheran church in Houston, married and have two children. My other hobbies include photographing and research of abandoned roads and bridges, true stereo recordings, playing bass guitar at church and watching tv shows about UFOs and the paranormal. The BLAISE family heritage comes from the Alsace-Lorraine part of France. ?I got my start in radio when my parents bought me a shortwave radio in 1972. I then had police scanner radios and CBs. Back then, scanners were crystal controlled. I had a Radio Shack scanner that had 10 crystals and I listened to police and fire. In my high school days (1975 to 1978, coincidentally the same time period as That 70s Show) everyone was putting a CB radio in their car or truck. That was my first introduction to two-way radio. ?I listened for several years to hams on local repeaters on my scanners but did not yet have a license. I do a lot of FT8 operating because I can use 25 watts and my small station to make lots of contacts. I also do some JT65 and occasionally work other digital modes. At present my highest output power is 100 watts. 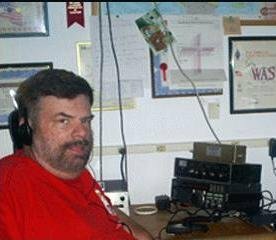 President of the Houston ECHO Society Amateur Radio Club since 2001. If you are in the Houston Area, listen for ECHO on 147.08 (103.5 tone) or 147.320 (100.0 tone). We meet the 2nd Monday of each month except December at the American Red Cross. Contact me for details. You are welcome to attend any of our meetings! December is a Christmas dinner at a location to be announced. Chairman of the Board and Fifth Call Area Director of the 3905 Century Club. If you are interested in fun group for working all states and DX awards, check out the 3905 Century Club. I represent the states of the 5th call area - New Mexico, Oklahoma, Arkansas, Texas, Louisiana and Mississippi and I run the monthly board meetings.